"Last time we played here there were like were like, 80 people," quipped Georgia Nott to a much larger crowd than saw their Montreal debut in May of 2014. 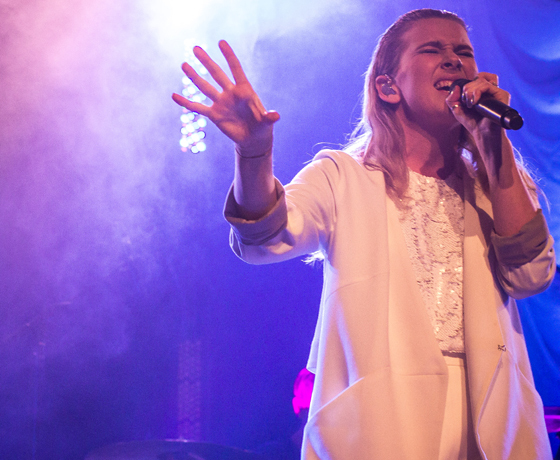 In less than a year, New Zealand brother-sister synth-pop duo Broods have amassed quite the Montreal following, with their new fervent fan base almost bringing the Théâtre Corona to capacity; people were already shouting and applauding long before their performance begun. Georgia came onstage clad all white — accompanied by her brother Caleb on keys and an added drummer for their live performance — and launched straight into early hit "Never Gonna Change" off their self-titled debut EP. They quickly followed with "Everytime" from their debut album Evergreen, backed by rainbow LEDs and bright spotlights, and while they were very energetic, they weren't altogether captivating yet. After a short chat, Georgia headed to a second set of keys to perform "Sleep Baby Sleep," which acted as an ideal showcase for her beautiful vocals, accompanied perfectly by Caleb. By the time they were performing "Taking You There" with Caleb on guitar, everyone in attendance was completely enthralled. After a quick chat about the enchanting Montreal snow, which they concede must be far less charming to locals, they performed their album's title track surrounded by billowing iridescent material. They followed with new song "Bedroom Door" and slow-burner "Medicine" that brought the energy down slightly, but were still effective. Their sparse acoustic rendition of "Four Walls" however, fared much better, bolstered by Georgia's powerful vocals. The momentum picked up significantly for fan favourite "Bridges," with the crowd dancing and singing along to the dynamic performance. "This song requires energy and you have to dance," ordered Georgia, shedding her overcoat as the drums of "L.A.F." kicked in. I think they would have danced regardless, as they were visibly excited to hear the recent single and proceeded to fully engage. An unprompted sing-along erupted for the final song of the set, EP-highlight "Coattails" providing yet another chills-inducing moment. Their two-song encore, including "Superstar" and "Mother & Father," highlighted the strength of their set, which is the duo's complete dedication to their material and performance. Add to that a crowd filled with people in just the right mood and you have the makings of a stellar concert, one that ended on an incredibly high note.